Look carefully over the past 20 years and you will have no doubt that the last two decades have been revolutionary; from communication to education and from business to entertainment. Everything underwent a sea-change. A majority of business owners either chose to, or were forced to digitalize their businesses. This led to a steep rise in the number of websites (the majority of them were made using WordPress) that ultimately touched the billion mark, back in 2014. However, as change is the only constant in today’s world, yesterday’s mantra for success may just not work today. There is no need to argue in favor of digitalizing one’s business today, as it is pretty much a given. However, what many businesses often neglect is the dire need to translate one’s website in multiple languages in order to reach out to more and more people. So just sail ahead and see why it is indispensable to translate your website today. Thanks to globalization, English no longer remains the lingua-franca of the Internet. Going by the volume of pages on the Internet, English still remains a dominant language, however if we go by the number of people, then more than 73% users prefer browsing in their own native language (not English). Hence if you opt for website translation, you are naturally going to get more traffic and more traffic may result in more conversions. If the above fact was news to you, brace up for another shocking fact. More than 46% users never purchase any product, unless it is offered to them in their mother tongue. This is where translation becomes important, as if you are not offering people products/services in their own language, you are missing out on your potential customers. “The best place to hide a dead body is page 2 of Google search results.” The sentence may have brought a smile to your face, but its truth is beyond doubt. No one ever goes to the second page of the search results. Translating text into a native language gives you an entirely new set of keywords in the local language, which can be easily exploited to improve search rankings. Today, translating one’s website into a different language is one of the easiest ways to take your business to your intended audience. The translated website acts as an offshore office, without forcing you to invest hefty amounts in setting up a real office. To sum it all up, website translation is one of the most convenient and quick ways to expand your business. 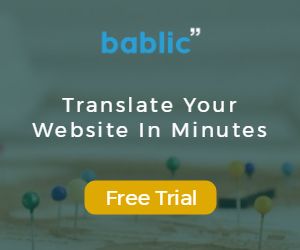 If you have a WordPress website and you want to get it translated, just click the link “Translate Your WordPress Site with Bablic” and hop on to a valuable resource.